With Earth Impact! from TI Education's STEM Behind Hollywood program released and tested by TI Education president Peter Balyta himself, it was only a matter of time before I gave the remaining activities in the now five-part series a try. Zombie Apocalypse was the first in the series, released to widespread acclaim from TI-Nspire-using teachers. I'm excited to bring this activity to teachers and students who use the TI-84 Plus C Silver Edition calculators in their classroom, and as always, I'll be keeping this topic updated while I develop this new activity. Wait... I didnt know this was a thing! So this new program will be used to teach how diseases spread in a population? That's right! You can read about the original activity on TI Education's website. It has become particularly timely as people seem increasingly paranoid about the threat of an ebola outbreak, and in fact would help put that in perspective. It teaches what different parts of the brain do, what virulence of a disease means for how it spreads, and a few other things. Hey awesome! Have you had a chance to experiment with 32colour images? I can convert if you need. Also, are you getting paid for this lol? Also, are you getting paid for this 0x5? No, I'm not getting paid for this; maybe I should be. I can't use the 32-color images, even though Tokens does the conversion, because my method of packing requires copying images out to RAM before displaying them. And unfortunately, 12KB of RAM is dear when you have 23KB to start with and a 5-8KB TI-BASIC program and some text in strings as well. I have to stick with the ~5KB low-res backgrounds for now, sadly. Wow! It really is amazing the added detail that colour can add . Looking awesome! Are you essentially just using the core of the Earth Impact engine, and adding in the data for this? No, it's much more complicated than that, since the graph modes are different, the simulation is completely different, and there are different special image + text pages (like the one above). Pretty much the only thing I'm reusing the paging system and the event handler. Definitely agreed! And xLIBC makes it much easier to harness the color than the built-in TI-BASIC tools. Ooo~ Hooray for future Celtic libraries would be a good one to have for sure! Thanks; I'm planning to add that one as soon as possible so I don't forget about it. Oddly enough, TI's version doesn't mention this equation anywhere. I'll probably try to put it into the Teacher Notes so that teachers can explain this derivation to interested students. Definitely glad you are taking care of these, I doubt I'd have been able to figure out the equation stuff myself. Things are looking good and I'm looking forward to running this on my CSE to test. Thanks. I remain surprised that neither the student nor teacher handout specifies the exact equation used for the graphs. I appreciate it! In fact, I finished delineating all of the text (that is, adding manual line breaks) during a long bus ride yesterday, and I resolved several bugs during the weekly HCWP session last night. The remaining item before finishing the handouts and giving the final product to you guys to beta-test is the simulation and graph on pages 24 and 25 respectively, which I'm working on now. Wish me luck! Edit: I'm working on the simulator, and I just want to document my attempts to convert a number N between 1 to 8 to an (X,Y) offset to a matrix element around some element (B, A). In other words, 1 should be above and left, 2 directly above, 3 above and right, 4 directly left, etc. Edit #2: The first pass at making an optimized, sufficiently fast simulator works, but is way, way too slow. I'm seriously considering using a little ASM stub to quickly determine which matrix elements to "infect" next. On the plus side, it looks nice. Wow, that looks impressive! And quite speedy! Are the blocks outside the grid on purpose, or a glitch? That was due to an unfortunate copy-paste error. I have since repaired it. Edit: And after a night and morning of work, it works! Unfortunately (and definitely a #firstworldproblem), it runs too fast (left screenshot). I used rand(5 twice per simulation step to slow it down slightly (right screenshot). Next up is the graph. Also, on the Nspire, it's actually pretty simple to get the regression (it can also make it in real time as the points gets added, but that has limited interest...). I use the rand(X) trick as a delay; it works quite well. And I presume it matches the equation that I deduced for it? Indeed, I plan to mention that in the teacher notes, but I think it would just confuse students. Because of the way I store the data, I could compute that logistic regression, but I'll save that as an exercise for the reader. Today I've been working on the graph. Edit #4: Finished that state thing as well, and I updated the help. I think the only thing left to do in the morning is see if there's a way to put the page number on every page, then get back to writing the documentation so I can release a beta. 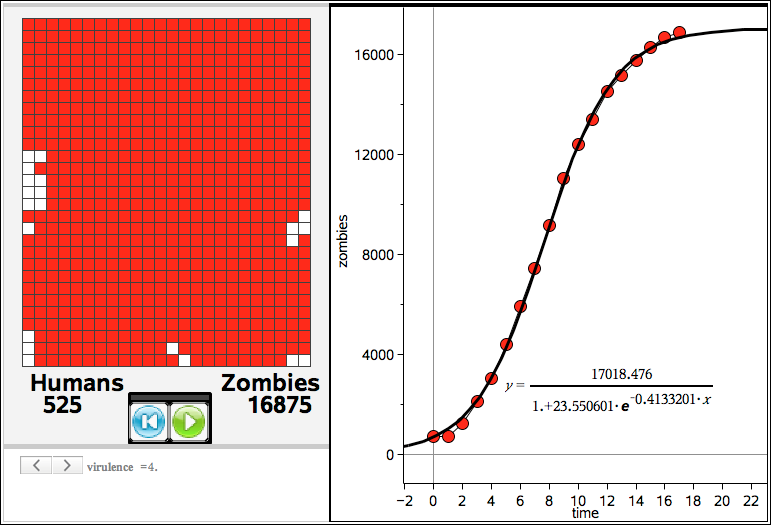 *bump* I have released a beta of the Zombie Apocalypse Part 1 activity for the TI-84 Plus C Silver Edition. I humbly request your help, TI-84+CSE-owning reader, to check over the student and teacher handout PDFs and try doing the activity yourself. Thanks in advance! Members: abornemath, Bernard_Perrenoud, Jeffitus, kat606. © Copyright 2000-2019 Cemetech & Christopher Mitchell :: Page Execution Time: 0.256020 seconds.